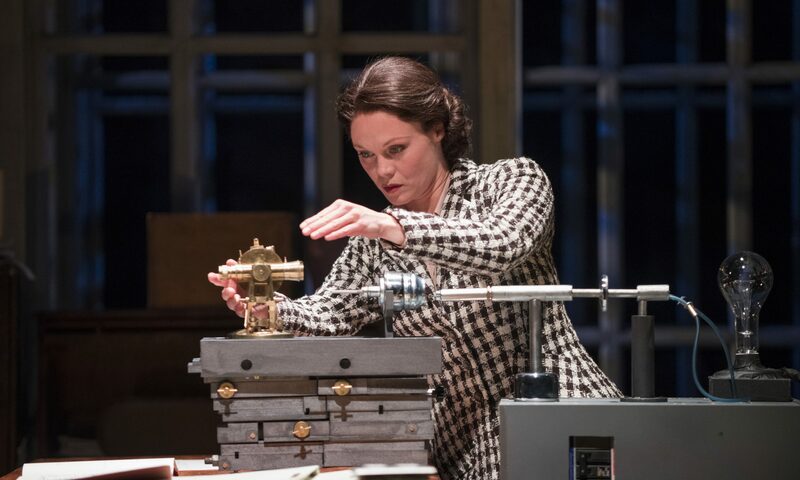 Dr. Rosalind Franklin in Anna Ziegler’s Photograph 51, is an exacting and brilliant scientist, one whose vital contributions to the world might have been all the more exciting had the field of science made room for her. Court Theatre’s production of Ziegler’s play is a stylish examination of the prejudice and misogyny that Dr. Franklin confronted while researching DNA at King’s College in London, England post World War II. An English chemist and X-ray crystallographer, Dr. Franklin is best known for her work with X-ray photographs of crystallized samples of DNA, though she was a pioneer in other areas as well. Her work with DNA, and specifically her X-ray photographs, were used by Drs. Watson, Crick and Wilkins to deduce and reconstruct the double helix shape of DNA, for which they would later win a Nobel Prize. Her later work with the molecular structure of viruses would be continued by her colleague Aaron Klug, who was also awarded a Nobel Prize. Dr. Franklin died in 1958 of ovarian cancer when she was just 37 years old, and it is only posthumously that she has been recognized for her contributions to the study of DNA. Photograph 51 is as much a eulogy for Dr. Franklin as it is a play about accepting responsibility for actions taken in the past. In a sort of play-within-a-play, self-aware characters (all men save for Dr. Franklin) grapple with their memories of Dr. Franklin at King’s College and step in and out of the story of the actual Photograph 51 to comment, qualify, and question critical moments. The characters argue and disagree about Dr. Franklin, and the events surrounding the discovery of the shape of DNA, often asking, “Is that really how it happened?” “Is that really what she said?” Director Vanessa Stalling weaves these voices together and reminds us that history is often written by those who hold power. Many of the male doctors that surrounded her have put out an account of the events in Photograph 51, often to contradict each other’s versions of history. Production dramaturg Derek Matson’s program material also mentions that Dr. Franklin’s sister, as well as Anne Sayre (a personal friend of Dr. Franklin’s) both wrote their own biography of her, though both their voices are missing from the play. Stalling’s world is one where the men who would go on to write Dr. Franklin’s story must face the audience and admit (or not) to their participation in misogyny. On a breathtaking set designed by Arnel Sancianco, reminiscent of crystal matrices, and layered photographs, a talented team of actors creates a sensitive retelling of Dr. Franklin’s life during this time. Chief among the talent is Chaon Cross, whose Dr. Franklin captures perfectly the frustration and exhaustion of a person who is constantly on guard and for whom professional respect is always twice as hard to earn. Cross portrays Dr. Franklin as demanding, exact, and brilliant, but never robotic and unfeeling. Nathan Hosner, a querulous Dr. Wilkins, Yousof Sultani, a warm and inviting Don Caspar, and Gabriel Ruiz, a welcome laugh as Ray Gosling, all play their parts beautifully. Less morally upright, but not in the least less talented, are Alex Goodrich’s Dr. Watson and Nicholas Harazin’s Dr. Crick. With costume design by Mieka van der Ploeg and Dialect design by Eva Breneman, we are immersed firmly in the scientific world of post-war England. Lighting design by Keith Parham and Projection design by Paul Deziel lend a quietly spectacular visual language to Dr. Franklin’s journey, and the unfolding of the story. In watching this play, the “what-ifs?” of Dr. Franklin’s story resonated deeply. What if instead of at being dismissed, infantilized or disrespected by her colleagues for being a woman, and worse a woman who did not fulfill their expectations, Dr. Franklin had been treated with the respect? As an equal? What if she had been given a reason to trust the scientists around her? This play is an accumulation of such critical moments in the life of Dr. Rosalind Franklin and a reflection on time and memory, fact and fiction. In the end the characters, as well as the audience, must face a solemn truth: the world turns with or without us and we have only the choices we make to comfort us.